I'm not ashamed to say it - I'll crush a Starbucks PSL. I smile gleefully as I wait for that first sip of the season. (Pumpkin Spice Latte for the uninitiated, although it contains no actual pumpkin, which often confuses people, but to be fair, it's pumpkin SPICE, not pumpkin PIE. Back to the point.) There have been several years I've looked forward to the yearly onlaught of all things pumpkin spiced. 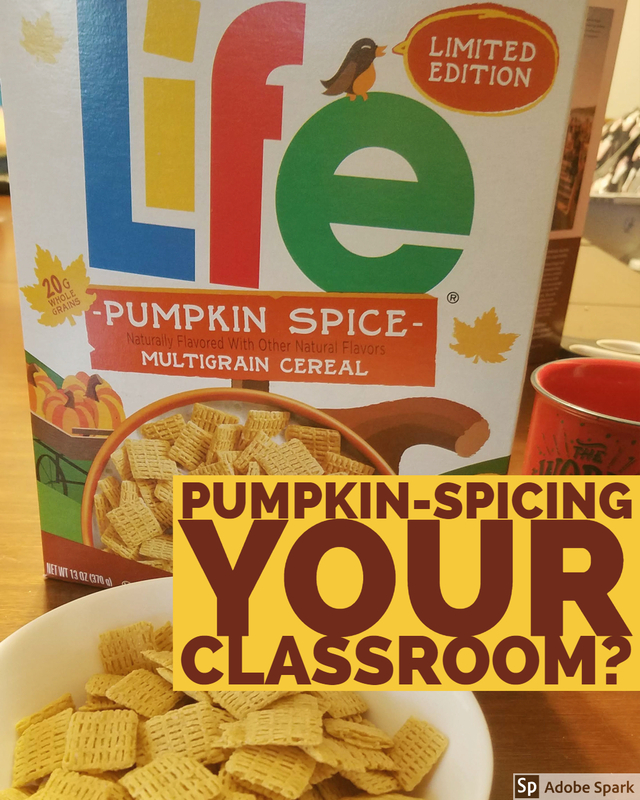 "I wish I could have pumpkin spice all year long," I thought one evening in front of the dry, non-dairy creamer at the supermarket. "If I buy a few of these, I can probably make them last several months at work. Win!" I proudly pulled out my creamer the next day and sipped my clever coffee hack, looking forward to the months to come. You probably can guess the end of this sorry. Just like Christmas carols, the Filet-O-Fish, and extended stays with family over the holidays, in order to appreciate a good thing, it's generally best for everyone if enjoyed in moderation. "What in the world does your PSL obsession have to do with teaching?" Fair question. Have you ever found yourself falling in love with a tech tool, website, or teaching strategy and wanting to use it ALL THE TIME? Kahoot! Quizizz. Quizlet. Thatquiz. KnowledgeHook. And that's just a list of formative assessment tools. I'm sure I could poll the internet and find websites from every content area, as well. I've found that the magic bullet website/tool/strategy that is going to get 100% of your students engaged all the time only works for a period of time. A particular trait of the gifted students in my classroom is craving novelty. If they expect what's coming, be ready to be looking at kids tuning you out working on something else next time you look up. Comfort is often unhealthy for us, too, right? We get complacent in comfort. Most of my students are building skills. Most of my kids are connecting with me relationally. Most of my students' parents came to conferences. You name it. So, yeah...I crushed the Pumpkin Spice Life in my cereal bowl this morning, and I'm going to definitely be pulling from my greatest hits as we head into the final stretch of the semester next week, but I'm going to remember that not everyone likes PSLs as much as I do, and I can only truly appreciate pumpkin spice if it stays in the fall where it belongs.